Although this was Weir’s first visit to Argonne, he is familiar with DOE’s national laboratory system. In the 1980s, he began his career as a 15-year-old computer-programming intern at DOE’s Sandia National Laboratories. Weir spent most of his time at Argonne giving a series of standing-room-only talks, geared toward middle school students who are participating in a computational meteorology camp, college interns spending their summer at Argonne, and middle and high school families and faculty from around Chicago. Weir is best known for rooting his stories in real-world science. When writing The Martian — Weir’s breakout novel that follows an astronaut’s struggle to escape Mars after being stranded — he dove into the details of botany, astronomy and orbits. With Artemis, Weir’s 2017 lunar adventure novel, he developed the plot only after researching how (and why) we would actually build a colony on the moon. “Only once I designed the entire city did I start thinking about plots and stories,” he said during a 2017 talk at Google. During his Argonne visit, Weir toured the Argonne Leadership Computing Facility (ALCF), the Center for Nanoscale Materials (CNM), the Advanced Photon Source (APS) and Argonne’s Electrochemical Discovery Laboratory, where scientists seek to uncover next generation batteries. The ALCF, CNM and APS are DOE Office of Science User Facilities. 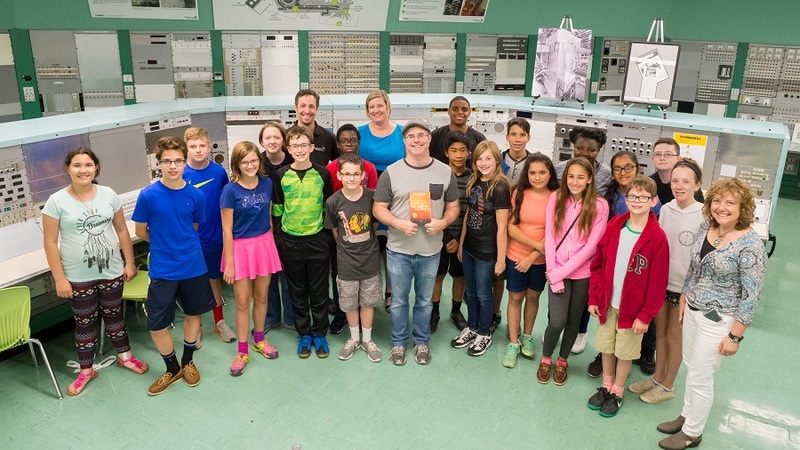 During his visit, Andy Weir toured the Argonne Leadership Computing Facility, the Center for Nanoscale Materials, the Advanced Photon Source and Argonne’s Electrochemical Discovery Laboratory. Weir is shown here with Argonne’s Katherine Riley, the ALCF​’s director of science. Weir’s visit culminated in a panel during which he joined Argonne’s Katherine Riley, the ALCF’s director of science, as well as CNM nanoscientist Ani Sumant and materials scientist Jason Croy. The group discussed the power of storytelling and the links between science fiction and scientific research. “All I have to do is come up with something that is theoretically possible. In practice, that’s hard. You [scientists] are all one big footnote,” joked Weir. Dr. Jason R. Croy is an internationally recognized expert on lithium- and manganese-rich cathode materials and has published numerous articles on the atomic-scale mechanisms governing the performance of lithium-ion electrodes.